After a mishap where a bulb shattered all over my garage I am finally OVER messing around with fluorescent tube lighting. Fluorescent shop lights are a pain to install and a pain to change and lets not forget the harsh bluish light they throw out. I’ve also noticed how they fade and destroy printed material (posters, etc) after a while. So here is what I did to replace one 48 inch (two bulb) fluorescent shop light. I bought 3 cheap ($8.00 each at a local Menard’s) clamp on work lights. These sockets are rated for 150 watts and come with a light weight aluminum shade. 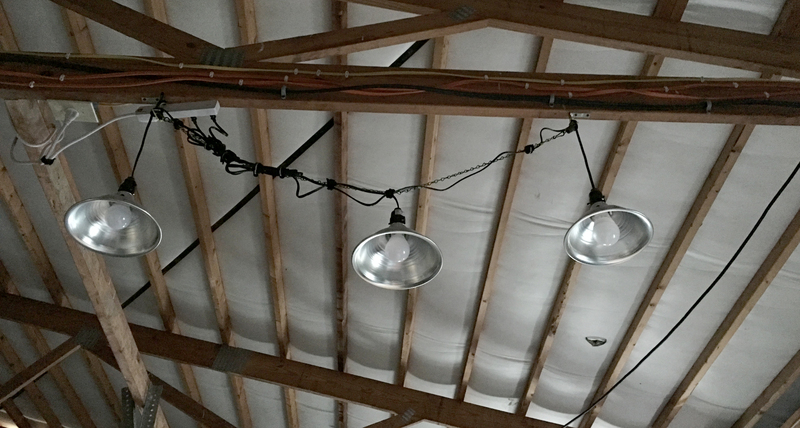 I then simply removed the clamps and installed LED light bulbs. The bulb nearest my work table is a 20 watt (75 watt replacer) Polaroid branded LED that kicks out 1600 lumens (a typical old incandescent 60 watt bulb puts out about 800). The light it puts out actually looks like an incandescent as it is a warm 2,700k in color temperature. The Polaroid was about $8.00. 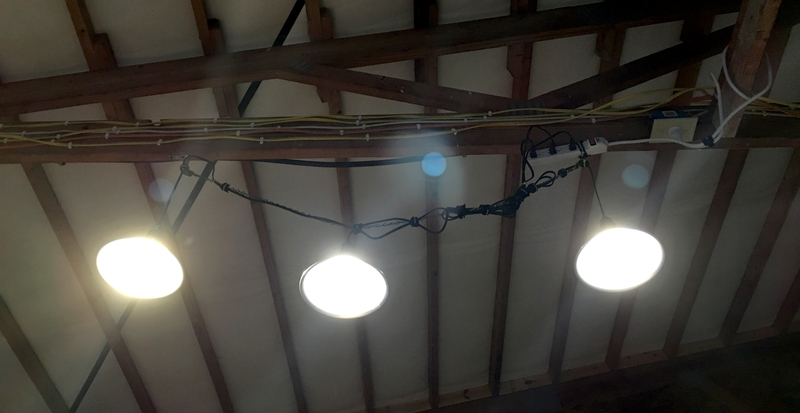 In the other two I used a couple of no-name (Menard’s house brand I think) 9 watt LED bulbs that put out 800 lumens each of 3,000K warm colored light. These bulbs came in a two pack for $4.49. I bought a $6.00 small power strip to plug them all into the single outlet that’s wired directly to a wall switch. I then attached and suspended the whole rig to a small 48 inch chain with Hook & Loop fabric wire-ties and a few standard plastic ones. The chain is attached to the same mounting points (metal L brackets) that were used for the old shop light. Total cost was about $37.00 -bulbs included. The old fluorescent tubes used 40 watts each so that’s 80 watts versus 38 watts! Seems to be a little brighter than the shop light and the color rendition is WAY nicer -which was not even a consideration for my garage but a nice bonus!